Makes lots! These cookies freeze very well (before icing). Put the flour, sugar and a pinch of salt into a food processor then add butter and vanilla extract. Pulse until the mixture looks like breadcrumbs. Pulse again to bring it together. Turn out onto a lightly floured surface and knead until smooth. Wrap in cling film and chill for 30 minutes. (If you don't have a food processor, you can of course do this by hand). Roll the dough out to about ¼ inch thick and stamp out biscuits using cutters. Place on baking sheets (you may have to chill again for 15 minutes of so). 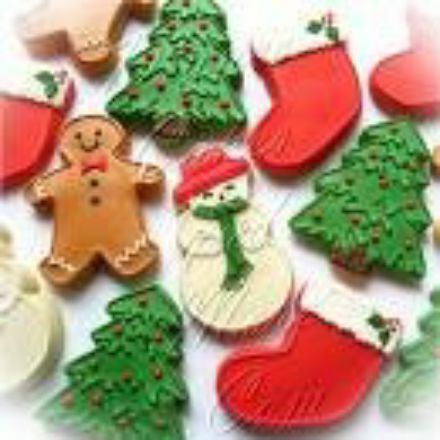 If you are going to hang the cookies on the tree, make small holes at the top of each shape with a plastic drinking straw. Bake at 350F (180C, Gas Mark 4) for 12-15 minutes. Remove and leave briefly on trays before transferring to a wire rack to cool. Use boiling water to make up the icing. Decorate as appropriate.